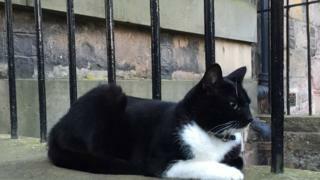 Edinburgh University's famous library cat has been reported missing. The black and white male cat, called Jordan, is owned by friars at the university's Catholic Dominican chaplaincy. But he spends much of his time asleep on his favourite turquoise chairs in the library. Jordan, who was last seen on 13 March, has a large online following and in 2014 was issued with his own matriculation card by staff. The university press office issued an alert via Twitter on Tuesday, asking people to keep an eye out for Jordan, who is known to frequent George Square. Students have since posted worried messages on a Facebook page set up for the cat. Louise Krüger wrote: "Come back library cat! There's no way I can get through these final essays without you and your sassy face." Natalia Sokolova added: " I hope you've just found a girlfriend, Library Cat, or hanging out with your mates. Do let us know you are OK, the last thing we need is to lose you."